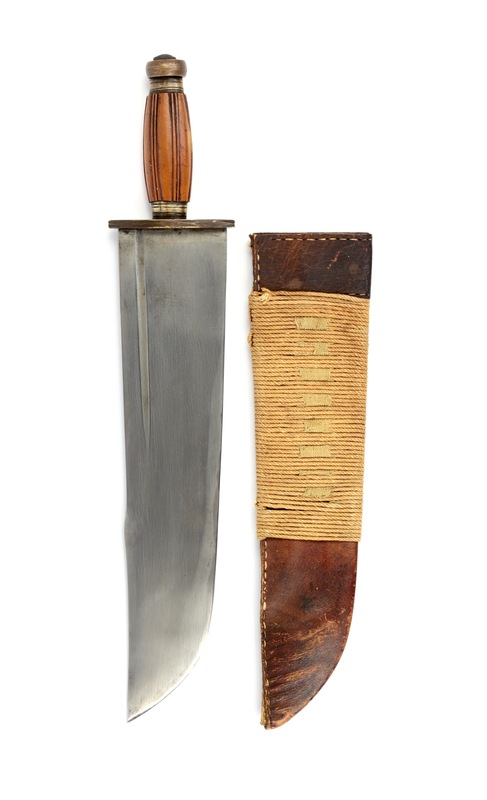 A large, wide-bladed Chinese fighting knife that weighs as much as some full length swords. 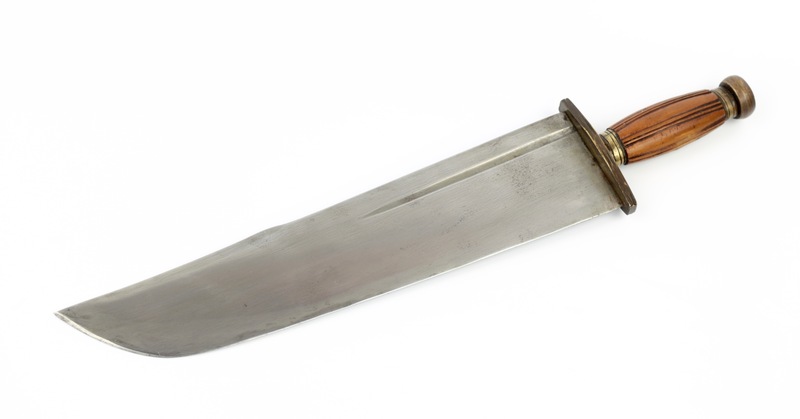 It has the relatively rare feature of a raised backedge, an influence harking back to medieval central Asian sabers that were introduced into China by the Mongols during the Yuan dynasty. 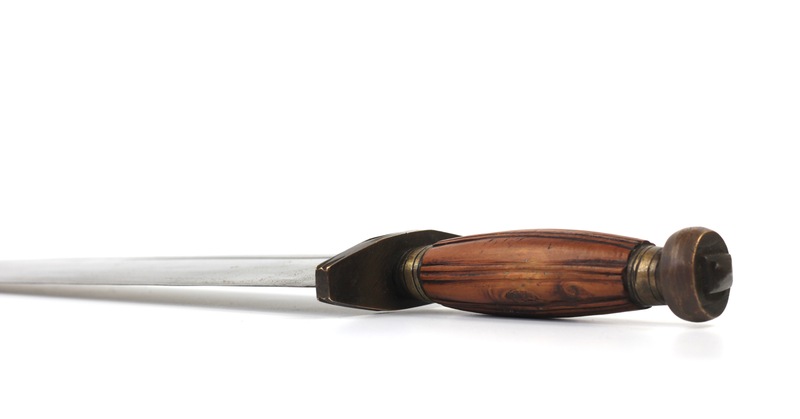 The guard and pommel are of solid bronze, the guard decorated with subtle file work. 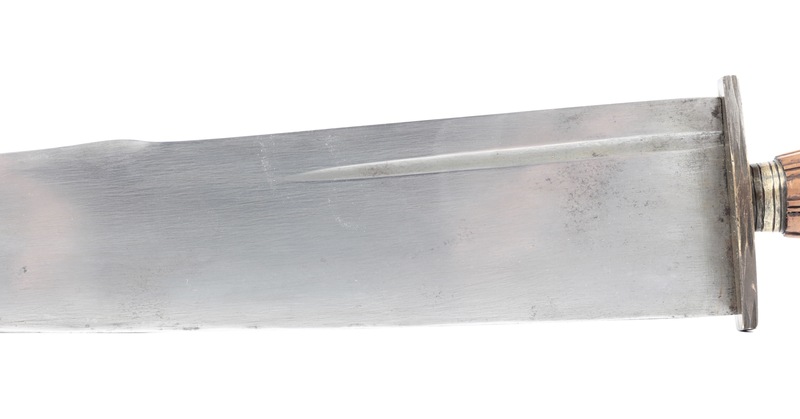 The hardwood handle with longitudinal grooves is held in place on either side with a brass ferrule. 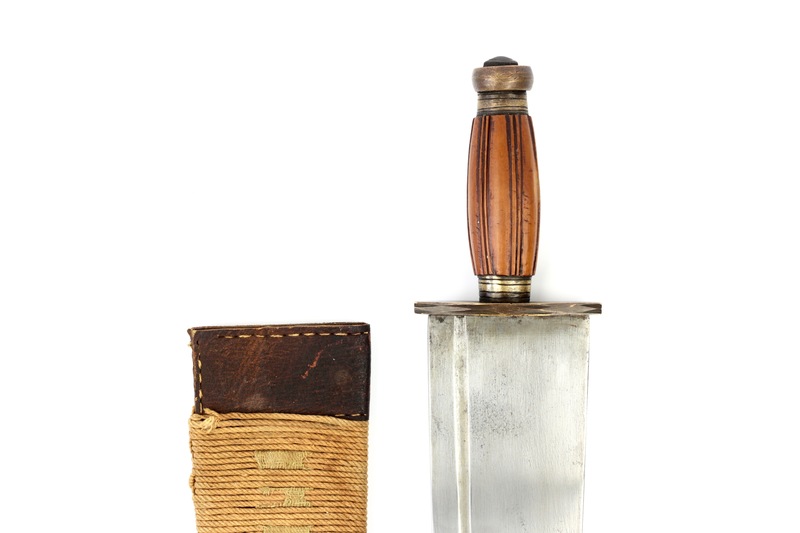 It comes in its original leather scabbard, some minor wear and tear but overall in great condition. The leather is not dried out, but still fairly flexible. 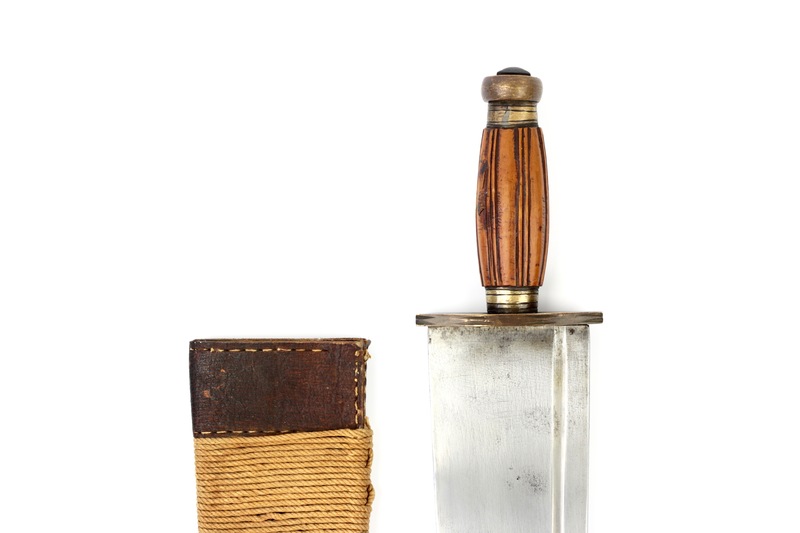 The scabbard is wrapped with cotton cord so it doesn't easily slip when tucked under belt or sash. The workmanship is typical for southern China. 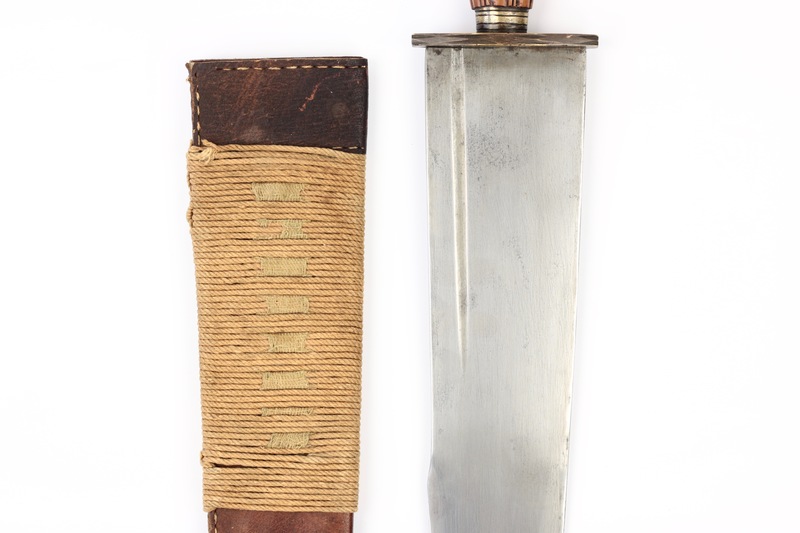 At the bottom of the left side of the scabbard are some faded characters, unfortunately I can’t make out what they used to say. 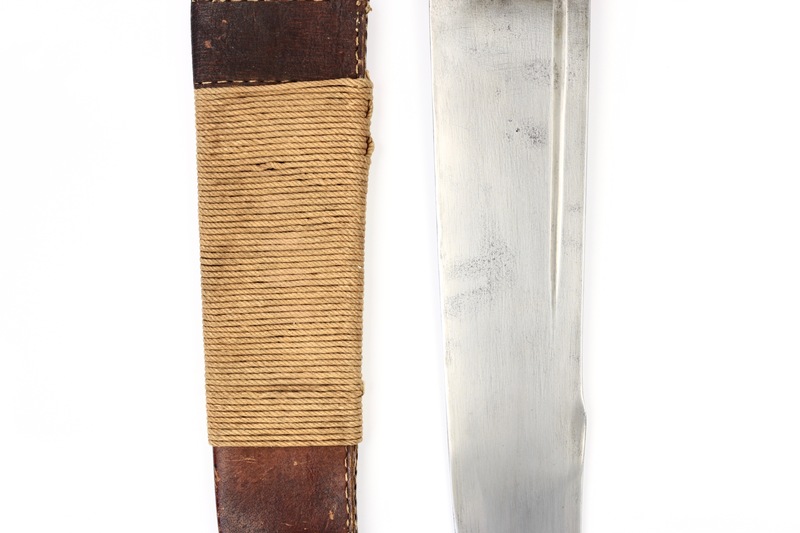 Knives of this style may well have been the predecessor of the wide variety of the hudiedao or "butterfly swords". 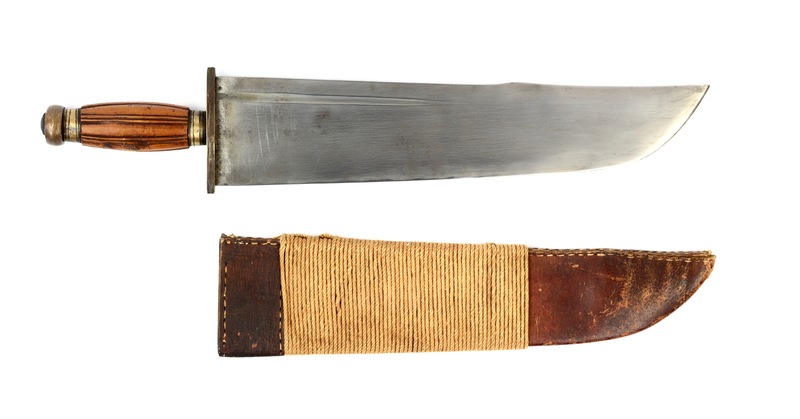 The characteristic D-shaped guard they added on that sword was probably inspired by Western naval cutlasses and entering knives seen at the harbours of Hong Kong and Guangzhou. 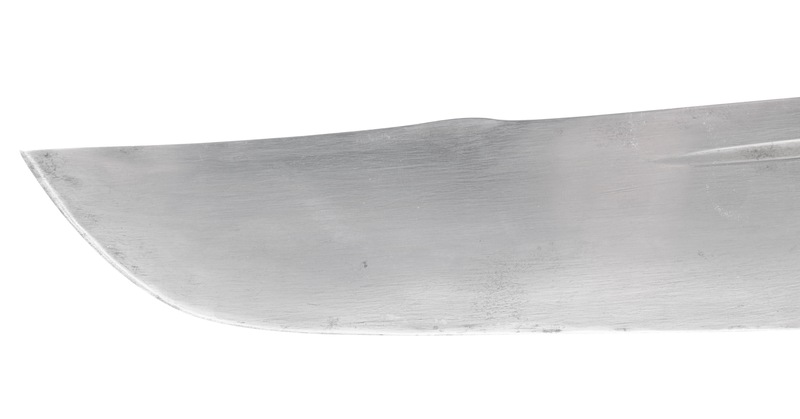 This example, with unusually wide blade, is purely “native” without Western influences. 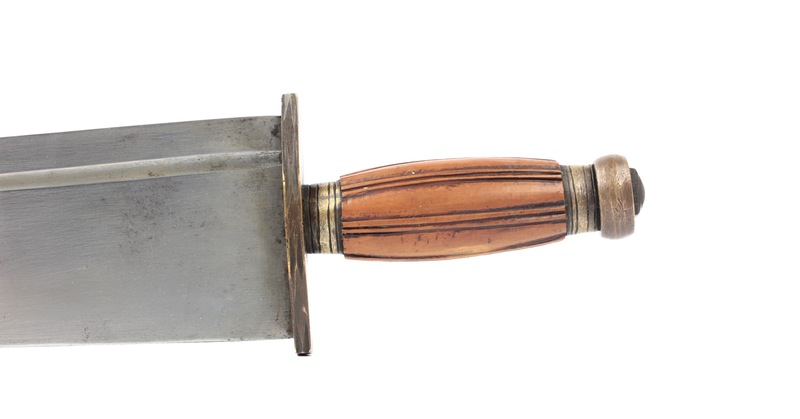 This example probably dates from the 19th century. 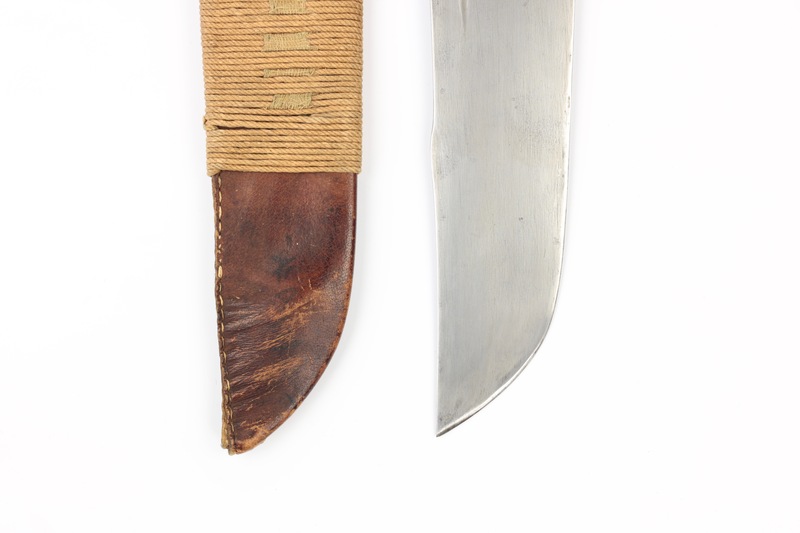 Because of its width there is considerable mass of steel behind the cut, ideal for cutting soft tissue: an effect the Chinese knew all too well from using their traditional cooking knives. The design is not optimized for the thrust, which in many cases is the most deadly attack. It is probably designed for martial artists who wanted the ability to neutralize an opponent but preferred not to kill him. Murder, like today, was illegal in the Qing and could get a martial artist acting as a security guard -which they often did- in a lot of trouble. 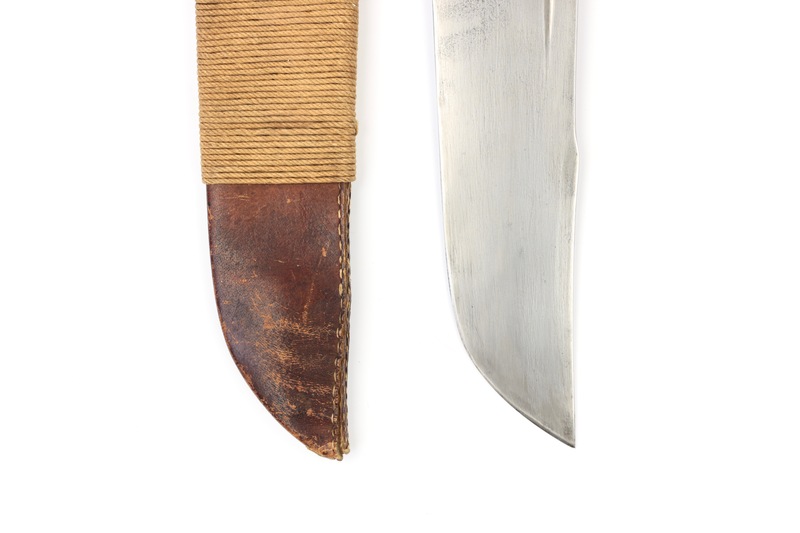 I believe these knives were made to impress, and if necessary demobilize an opponent by cutting ligaments, but designed so they were not likely to accidentally kill. They could kill, of course, if absolutely necessary. 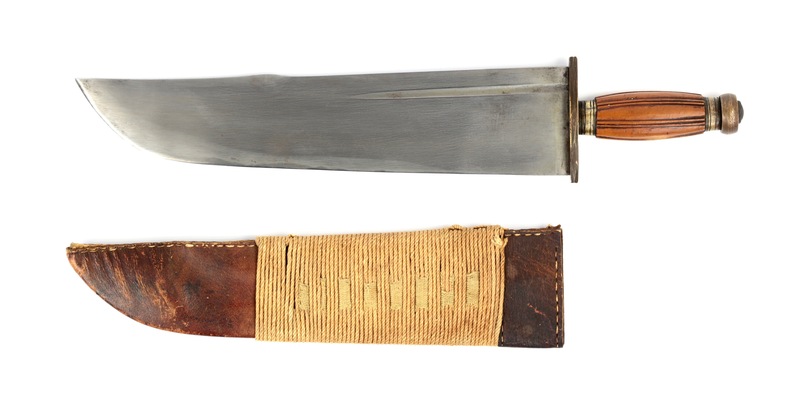 A nice, clean example of a Chinese fighting knife, complete with its original scabbard. It is of good quality and in excellent condition. What I like about these pieces is that clearly a lot of care went into them, yet they do not to pretend to be anything they are not. 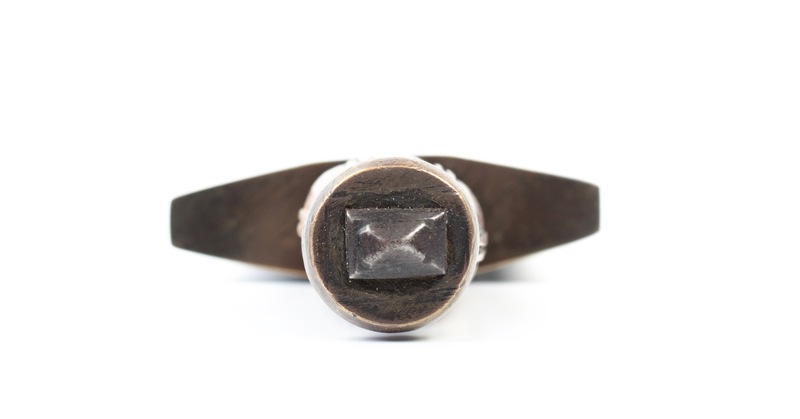 Simple, honest workmanship that does what it promises to do.